Because of the relative age of the company, and the longevity of the style, it's pretty much accepted that Martin was responsible for the evolution of the currently popular styles of flat top steel string guitars. 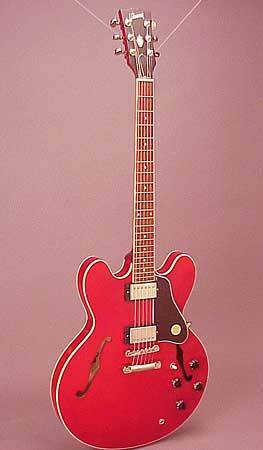 Gibson can claim a direct influence on the development of the jazz guitar. 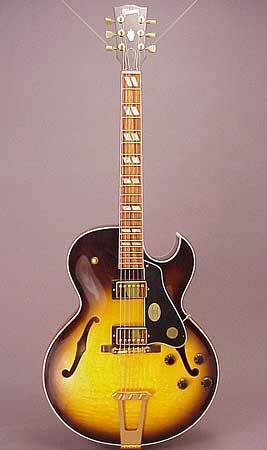 In fact, virtually every feature of the modern jazz guitar came directly from Gibson's R & D.
The carved, arched top and back, "f-holes," adjustable bridge, adjustable truss rod, cutaway, elevated fingerrest, and even the electric pickup - all introduced by Gibson. Naturally, you can play jazz on any kind of guitar, and there is some important jazz music performed on guitars otherwise thought of as folk style guitars or classical guitars. Please click on the photos with blue borders to go to the gallery articles. At 18" wide, this is as big as Gibsons got, although some other makers managed 19" wide instruments in an effort to achieve more projection in the 1930s. Of course, the advent of electronics obviated that need in most situations. 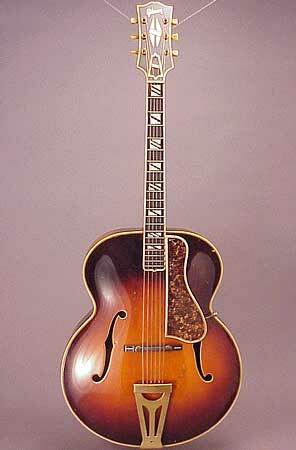 This Super 400 predates the time when the cutaway became the jazz standard, sometime after WW II. Often called a "full body" or "deep body" electric, this instrument is made of laminated maple, even for the top. As a result, it has a relatively small acoustic voice, but a very smooth electric tone. In general, jazz guitarists appreciate a smooth, mellow tone, where the timbre of each of the notes is as uniform as possible, whether fretted high on the neck or played in the open position. Arch top instruments are far more likely to provide this kind of response than acoustic flat tops. And while some musicians play jazz on guitars like this Gibson ES-335, its thin body design provides much less acoustic tone, and is damped to help reduce feedback at high volumes. 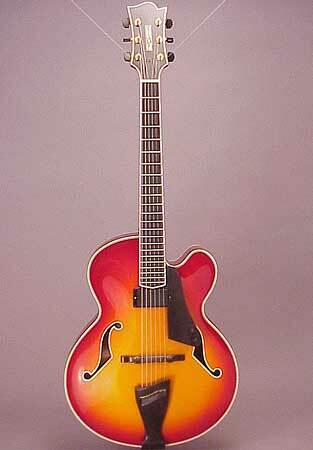 The thin hollow body electric is more likely to see duty in rhythm & blues, "rockabilly" and other similar electric band settings. This style instrument is most associated with the legendary Gypsy guitarist, Django Reinhardt. 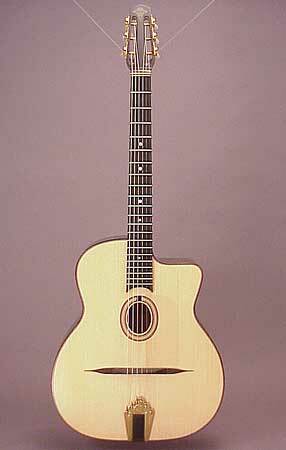 It has the movable bridge and tailpiece of the archtop guitar, yet the body is made from thin wood much like a flat top guitar. This is a tough guitar to categorize, so it's usually called a "Django style," "gypsy style" or "Maccaferri style," after its originator.